Lighting-Gallery-net - Incandescent - General Service 25-100 watt/New Type Edison 16c from the 1890s!!! New old stock!!! 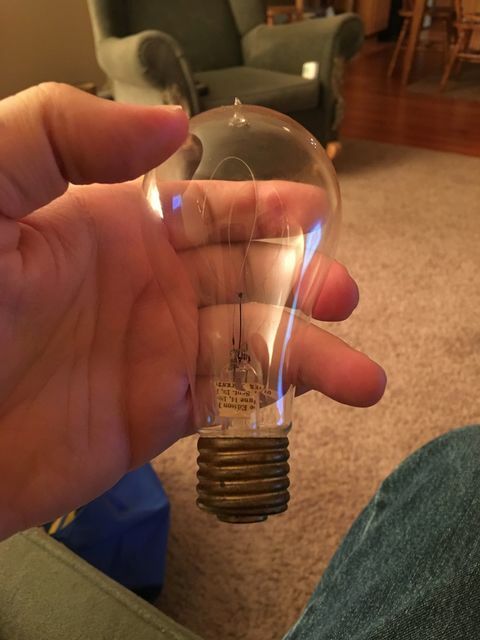 New Type Edison 16c from the 1890s!!! New old stock!!! eBay find. Cost me a mere $50 for this Victorian era beauty! This design was introduced in 1893 with the new squirted cellouse carbon filament. Previous filaments were made of bamboo. The base is an evolution of the 1888 design, with a shorter upper rim while retaining the 1888 plaster of paris and bottom contact. The lead wires in the stem are free of corrosion. The filament is intact and working, and the glass is crystal clear. Truly an amazing piece of early electric lighting history! Lumen Efficacy: haha not much! What a throwback! Is this the oldest lamp you own? LOL it is about 2 lumens per watt, still more efficient than most LED trash after the phosphor fries in a month or 2 and they just glow a dim blue! Awesome lamp. Of course, my oldest lamp is my NOS 1888 Edison Bamboo filament Taper Neck lamp. NOS from the 19 th century. LOL it is about 2 lumens per watt, still more efficient than most LED trash after the phosphor fries in a month or 2 and they just glow a dim blue! . ...I have never seen that before. @Ria the seller was dumb enough to light it before selling it lol. But it made it! One tough little bulb! James' New Type Edison is a bit newer than mine. The straight sided pear shape didn't come along until the late 1890s. Ah, right, didn't notice the difference in the bulb shape. What a find! What was the life on the bamboo filaments? I think 600-1000 hour. Good question.